“We take off the head, then we squeeze the juice and seeds onto the ice cream - it’s got to be Peter’s ice cream though, otherwise it doesn’t follow true family tradition”, smiles Troy Bennell (Ngalang Wongi Aboriginal Cultural Tours). ‘Pigface’, what an ugly name for such a beautiful flower. The Aboriginal (Noongar) people call it ‘Bain’ – it is one of the many native plants and flowers that were foraged, long before European settlement. Much more than just for food or medicine, wildflowers were also used to make hunting, gathering and other tools. 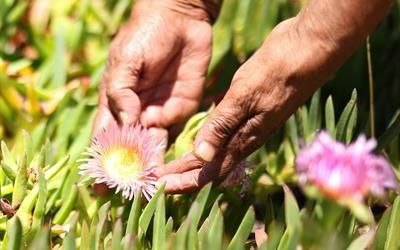 The ancient knowledge, handed down through many generations, as to how and when the flowers can be used is critically important, “you can’t just harvest pigface any time, you need to recognise when it’s right” says Troy, “the signs are in the colour and maturity of the flower”. For the Noongar people in Australia’s South West region, August and September mark the Djilba season. Characterised by the blooming of wildflowers, this is the time when, traditionally, the Noongar people would journey to the coast. The blistery winds are starting to slow down, making way for warmer weather and for the birth of new life in the country – Djilba is the Noongar season of conception. Now is the time for the emu males to ‘take a seat’ on the nest – emu eggs were gathered and sometimes the birds were hunted. ”The wildflower season is an exciting time of the year”, says Joey Williams (Poornarti Aboriginal Tours), “the Donkey Orchids, Spider Orchids and such are a part of our ‘potato’ family harvest, the yellow blooms signify the colour of fat, i.e. the kangaroos have grown fat on the new growth of spring”. And towards the end of Djilba, when the baby swans are out on the water, there will be other plants such as Boronia in flower. It’s all part of nature’s cycle – everything is connected and carefully balanced. For more information about the full range of (over 100) cultural tours and experiences available, visit waitoc.com.